Every time I go into a Scandinavian/Nordic interiors shop I wander around swooning over all the beautifully designed furniture. I can’t afford the furniture but don’t want to leave empty handed so I buy a pack of Marimekko paper napkins. Marimekko prints are a favourite of mine and have used their designs in lots of crafts and DIYs. I even have a Marimekko wallpapered staircase in my home and a unique decoupaged Marimekko bench in the garden. This time I thought it would be fun to show off lots of the Marimekko designs in one go. 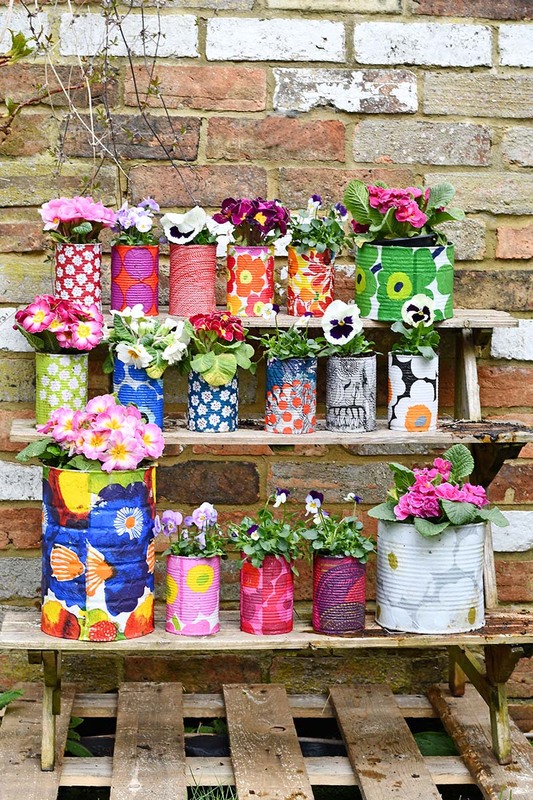 That’s when I got the idea for making a load of upcycled decorative tin can planters for the garden with the paper napkins. 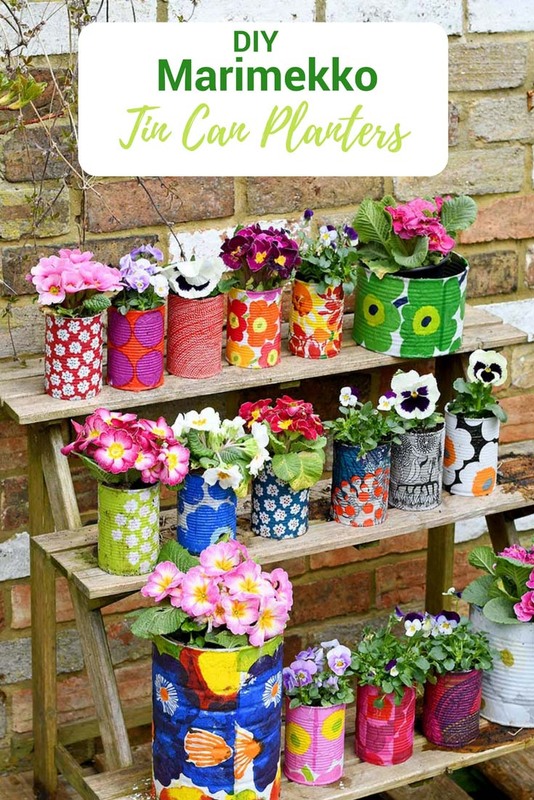 I love to repurpose tin cans into planters and collect them throughout the year. OK, you may be thinking, you aren’t a paper napkin addict like me. And you I don’t want to buy lots of packets of paper napkins, just to make some decorative tin can planters. Well, you don’t have to, there are plenty of sellers on eBay that sell paper napkins in small amounts specifically for decoupage. 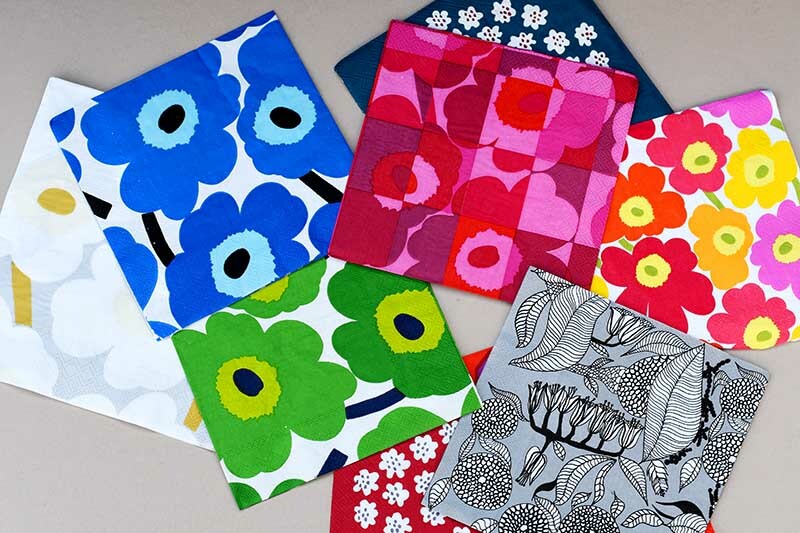 You can easily buy a variety of Marimekko paper napkins without having to buy lots of packets. 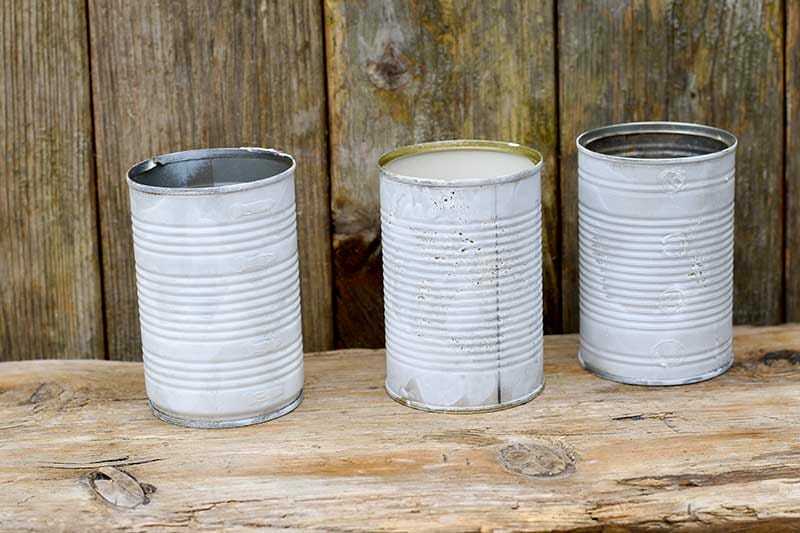 Empty tin cans – I used lots of the normal soup sized cans and a few big catering tin cans. Marimekko Paper Napkins – As I have mentioned on eBay, you can buy just a few napkins at a time rather than a whole packet for each design. You only actually need one napkin per tin can. Before decoupaging the tin can planters spray paint them white. 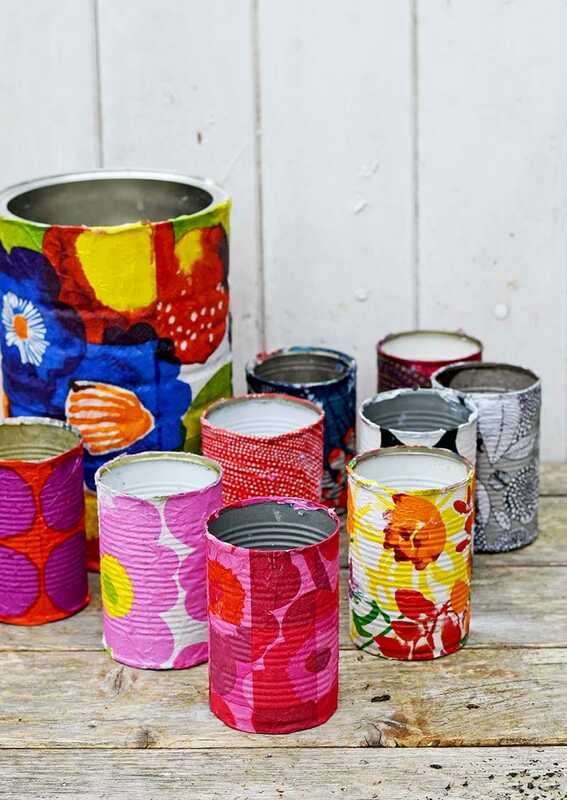 Firstly using a rotary cutter and mat, cut a Marimekko paper napkin to the size of the tin can to be covered. Next cover the white tin can in Mod Podge. Separate out the cut three-ply napkin to the top printed ply. Carefully, lay the paper napkin on to the Mod Podge covered tin, and press down using a large foam brush. Wrap the napkin around the tin until it is all covered. Once the Mod Podge has dried spray paint the decorative tin can with at least 2 coats of acyrlic varnish. Allowing the varnish to dry in between coats. 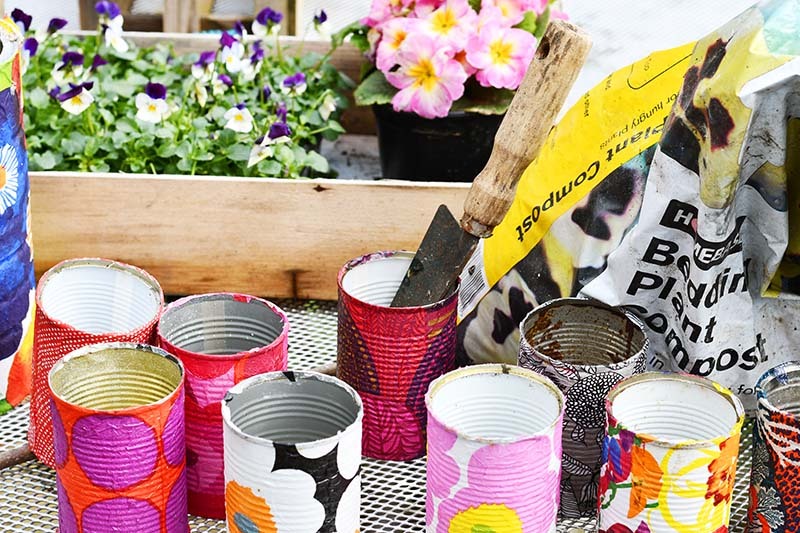 I planted up the Marimekko tin cans in the same way as I planted my colourful tin can planters. That is I firstly drilled holes in the bottom of the cans for drainage. I then added a layer of stones before the potting soil and bedding plants. 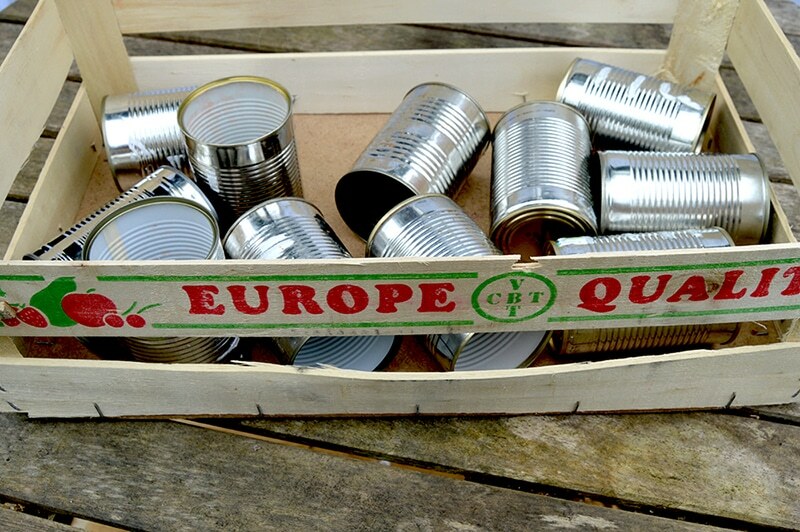 Now all that is left is how to decide how to display the decorative tin can planters. I sprayed my Marimekko planters with the acrylic spray as I wanted them for outdoors in the garden rather than indoors. I have a traditional Victorian walled garden and they certainly brighten up my brick wall. 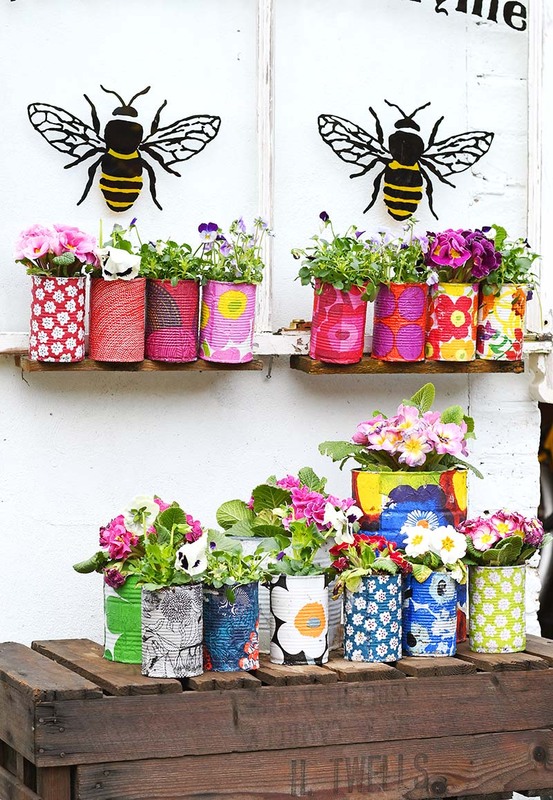 One thing is for sure these Marimekko planters are a cheep and easy way to add a lot of colour to my garden. 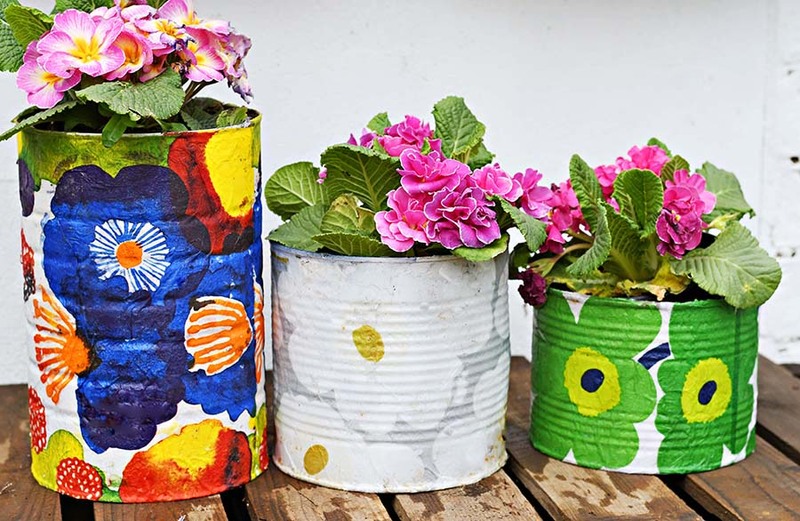 I’m busy saving more tin cans to upcycle into decorative planters. If you are looking for an even easier tin can planter idea you should check out my gold crushed tin can planters. 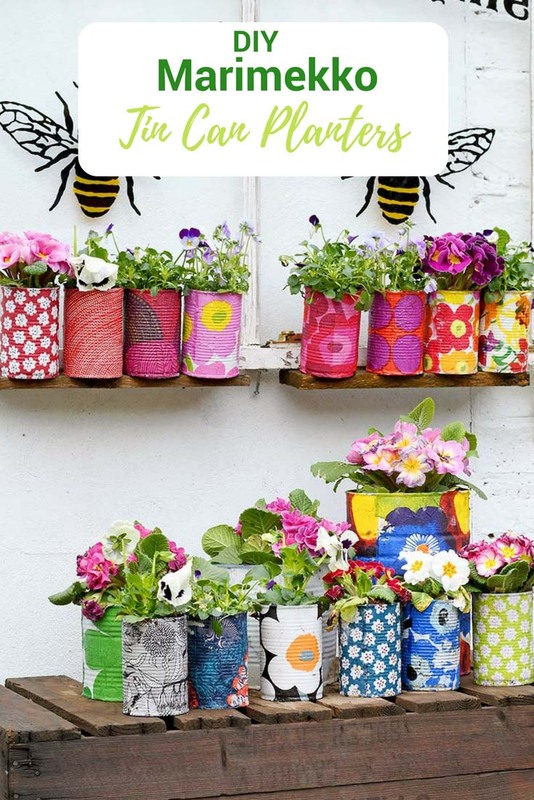 Or you can find more upcycled planter ideas on Favecrafts. Love these, so bright and effective. 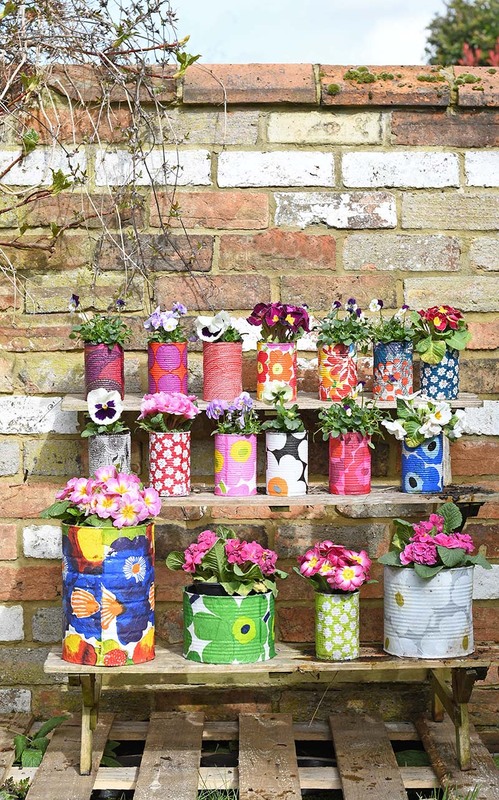 I love what you did with these old tins cans. 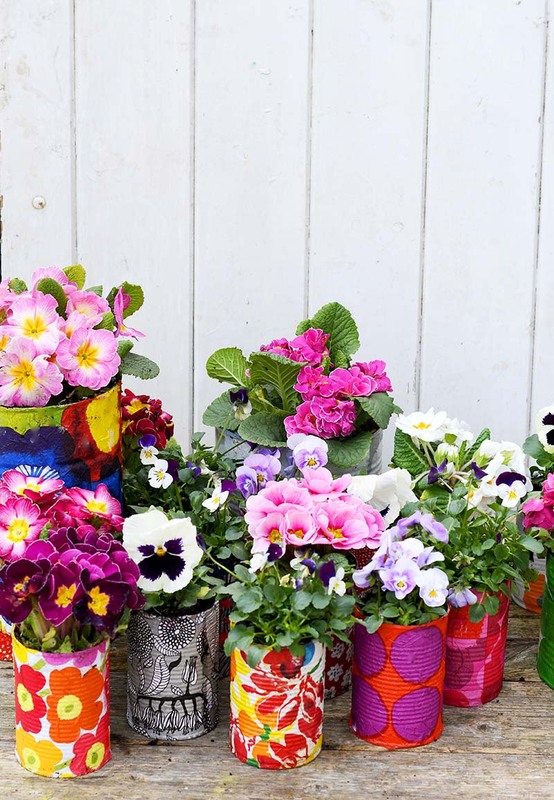 What a great way to recycle and they look so pretty. Congratulations of being featured on #GoingGreenLinky> sharing on twitter and pinning. Have a healthy, happpy & blesse day! Thank you so much. They certainly brightened up the garden. Yes they would certainly brighten up the home. Claire these are the prettiest most colorful planters EVER!! Thank you for sharing with us at Create and Celebrate…you are one of our features for the next party!! Thank you so much Susanne. I look forward to seeing the feature. Thank you, Caro. They certainly brightened up the garden over the dull spring we had, and they look even better now the sun is shining. I am in love with this colorful idea and it’s going to be great for my herbs. Thanks for joining us again at Celebrate Your Story, have a great weekend. Thank you so much, Sandra. I think they will look lovely with herbs. So pretty, I have done this with cans as well but I made them into pencil and paper clip holders. I love the idea of adding the color for flowers. Thanks for sharing on To Grandma’s House We Go! Thank you. Yes they would make lovely craft caddies too. Thank you, they would make lovely craft storage caddies too. I love these. I love how bright and cheerful they are. I think you have introduced me to a new project. Ahh, thank you so much. They do make me smile. Thank you, Kimberley. They are certainly brightening up the garden on these dull days, I can’t wait for the sun to shine again. Just lovely, you can’t go wrong with colour in the garden, especially if the weather isn’t playing ball! Thank you Julie, they brighten up the garden even on these dull days. wow, wow, wow, you have done it again, Claire! Just love this idea, and am now kicking myself for tossing that large can I had……will just have to get some more! Thanks so much for sharing on craft schooling Sunday! Thank you Sara. I know you’re a Marimekko fan too! Claire, I love all of the color and the bee too! Thanks for sharing at Vintage Charm! 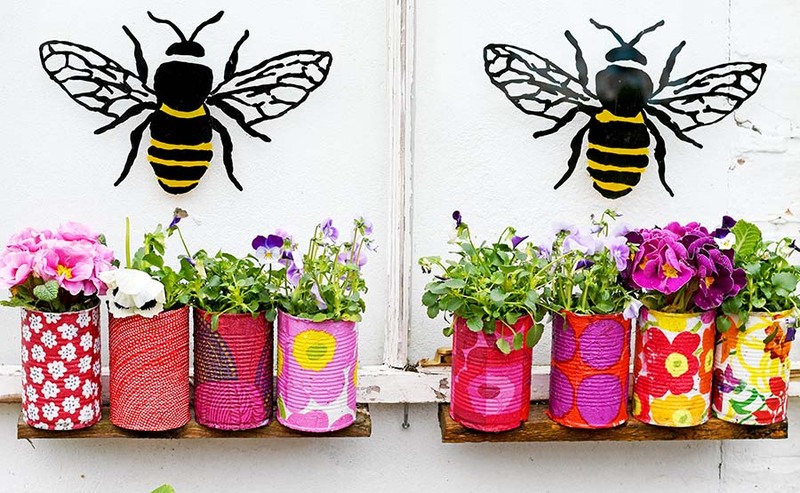 Love, love, love these planter cans! Anything bright and colorful gets me every time, LOL. Ahh, thank you so much, Victoria. They are certainly bright and colourful. Those are stunning beautiful! I love the bold designs and colors and how you’ve mixed them all up to one really beautiful statement. PInned. Thank you so much, they do really brighten up the garden.